Let’s talk about some pants that as tough-as-nails. 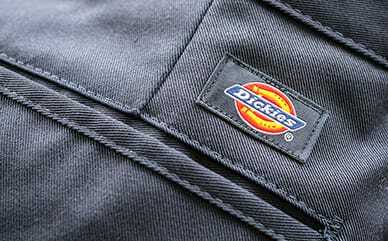 Dickies’ Denim Duck Washed Stretch Double-Front Carpenter Pants come in slightly below the waist with heavy-duty rivets on the front pockets. The brushed duck material is made from a cotton/spandex fabrication, keeping it durable, with enough stretch for comfort. Knee-pad openings on the front make working on your knees easy, while the utility pockets and hammer loop provide space for your necessities. The best part is the contoured waistband that stretches to prevent any gapping in the back.